Cable management software for controlling the design, routing and installation of all types of cabling. Export of AutoCAD� objects (trays, space allocations, devices etc.) to CMPIC� from the model. Synchronisation between the model and the CMPIC� database to ensures consistency for routing purposes. This synchronisation is normally driven from the model. The CMPIC� macros identify 3D polylines, blocks or other objects in AutoCAD� which represent the cableways and uses these to create the cableway network in CMPIC�. Automatic cable routing from within AutoCAD� or in CMPIC�. Comprehensive rules and rule-sets can be applied. Manual cable routing from within AutoCAD� with CMPIC� checking for viable potential routes based on rules and parameters set. Interrogation of cableways in the AutoCAD� model to show a list of cables running at a given point. Viewing of cable routes in the AutoCAD� model. Generation of AutoCAD� single line cableway drawings using data from the CMPIC� database. Included in CMPIC�s standard functionality there are a number of facilities which are available to all users but will be of particular interest to shipbuilders. A major challenge in cabling design is how to manage the variations in cabling from one design to another within the same �class� of vessels. The approach taken to handling this problem in CMPIC� is through Configuration Management (CM). CM allows you to manage both the vast majority of cables which are common to all vessels within a class, as well as those which are vessel or vessels specific. These variations are all managed within the same CMPIC� database - there is no duplication of data and therefore no need to maintain consistency between per-vessel databases. The software achieves this by enabling the user to �apply� any cable or associated data to one or any number of vessels in the class. Using CM, the number of vessels in the class is defined up front (although this can be increased if further orders are placed) and from then on the applicability of all cables & associated data are managed by CMPIC�. Using configuration rules CMPIC� of course checks for consistency and logic ensuring that users cannot enter erroneous or inconsistent data. As an example you would not be able to create a cable for a vessel where some data on which the cable was dependent was not applicable to that vessel. Items which are configured in CMPIC� include cables, nodes, nodal network segments, systems etc. Clearly, where space is at a premium and segregation rules are stringent, the management of segregations is paramount. CMPIC� can be configured to allow either single or multiple segregations on the same part of the nodal network. Where multiple segregations are allowed, CMPIC� offers segregation spacing to be invoked which is then taken into account in the % fill calculation for the nodal network. These segregation spacing rules can be configured by the user to meet customer specific or regulatory requirements. CMPIC� can also cater for the use of Mu-Metal and conduit to separate segregations and takes account of this in its % fill calculations. The setting of �tape marks� on cables to help identify the correct point to which a cable should be pulled. The tape mark can be set from either end of the cable. Where cable installation is carried out on more than one site or using subcontractors, CMPIC� can be used to co-ordinate the activity on these sites. Access to information within CMPIC�, which might be sensitive, can be protected. If CMPIC� has been used to manage the design and installation of cabling on a project then the database which has been created can be used as an important part of a through life support system for the plant or ship. For example, you would be able to interrogate the database to find out which cables were installed between two given points or devices. You could also see which cables run through a room which has been damaged by fire and which systems are affected as a result. There is tremendous potential for exploiting the CMPIC� database for through life support and maintenance purposes. Included in CMPIC�s standard functionality there are a number of facilities which are available to all users but will be of particular interest to companies involved in plant design. 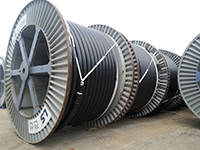 Conduits can contain a single or multiple cables and % volume fill of each conduit is maintained by CMPIC�. Listed alongside each of the cables available for linking to a conduit is the % fill which would result if this cable were added to the conduit. CMPIC� caters for the creation of multiple levels of tray to accommodate the various cable segregations used. These levels do not need to be individually modelled in CAD but can be created in CMPIC� based on attributes held in the model or passed to CMPIC�. Connectivity between levels where required can be created in CMPIC� itself. In a large plant design there may be requirements for routing cables through trays, trenches, ducts, underground duct banks, watertight or gas tight penetrations, conduits, pull boxes etc. CMPIC� caters for all these requirements.